Propulsion: Four Heine oil-fired boilers, one 2,800ihp vertical triple expansion steam engine, one shaft. 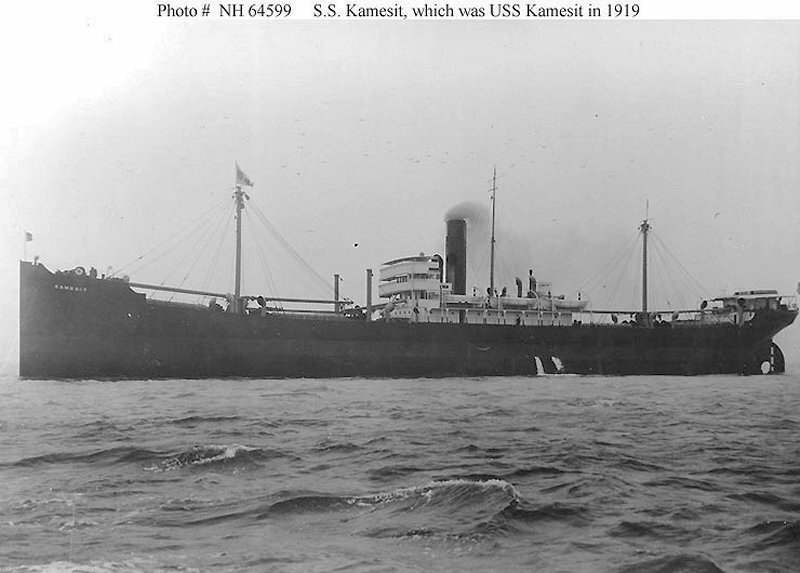 Dictionary of American Naval Fighting Ships: Kamesit, a cargo ship, was built by the Moore Shipbuilding Co., Oakland Calif., in 1918 for the USSB; delivered to the Navy in January 1919; and commissioned 29 January at Mare Island, Calif., Lt. Comdr. A. [Andrew] J. Shrader, USNRF, in command. 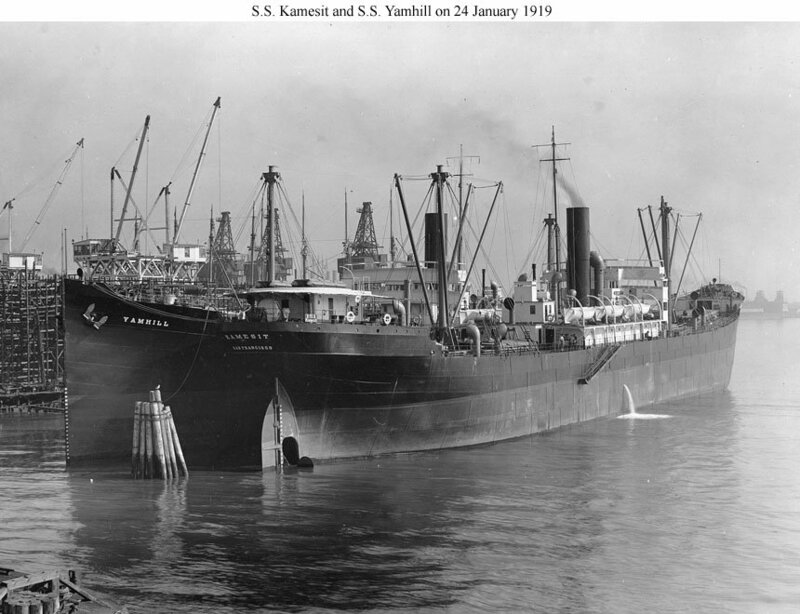 Departing Mare Island 1 February, Kamesit loaded with barley at Porta Costa, Calif., and sailed 13 February for New York via the Panama Canal. She transited the canal 28 February and diverted to Newport News, arriving 8 March. After receiving repairs and fuel, Kamesit sailed the 18th for Hull, England, where she arrived 6 April to discharge her cargo. Loaded with ballast, she departed for New York the 18th and returned to Hull the same day for repair of a disabled steering gear. Underway 26 April, she received orders 8 May to proceed to Philadelphia and arrived 18 May. 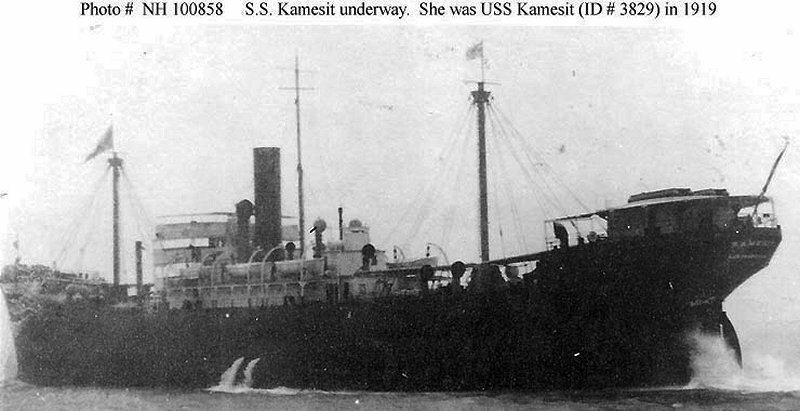 Kamesit decommissioned 23 May and was delivered to USSB the same day. She remained in custody of USSB until abandoned in 1930.